In Johannesburg Zoo, Should the Last Elephant Stay or Go? In this Tuesday, June 19, 2018, photo Lammie at the Johannesburg Zoo. Some said the 39-year-old Lammie should be sent to another place to spend time with other elephants.The zoo says Lammie is staying, and that a search for a new mate is underway. 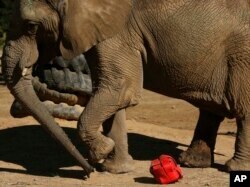 The last African elephant at the Johannesburg Zoo, Lammie, lost her male partner to a sickness in September. Lammie was born in the zoo 39 years ago. She had lived for 17 years with Kinkel, who died at age 35. Kinkel had been rescued in the wild after his trunk was caught in a trap in 2000. Around the time of her partner’s death on Sept. 4, Lammie had stopped eating. The day before Kinkel died, she was seen trying to help him get up. Elephants are known for their intelligence, strong social ties and even the ability to mourn. Some people argue Lammie should be sent to another place where she can be with other elephants. Audrey Delsink is wildlife director of Humane Society International/Africa. She said Lammie “is in desperate need of a happier existence and the chance to live out her years with other elephants.” Delsink added that a wildlife rescue place is ready to take Lammie if the Johannesburg Zoo agrees to let her go. But the zoo says Lammie is staying. The zoo says it serves an educational purpose, especially for the poor who cannot pay to visit wildlife parks. Michele Pickover disagrees. She is director of the EMS Foundation, a South Africa-based African wildlife rights group. She said “nobody learns anything” by seeing an elephant in captivity. She said that watching a film about elephants would be more educational. But, a spokeswoman for the Johannesburg Zoo, Jenny Moodley, says it is looking for a new partner for Lammie. She said the zoo is following guidelines in its search set by the World Association of Zoos and Aquariums. She added that experts are closely observing Lammie and that the elephant might not adapt well to a new environment. The Associated Press reported this story. Hai Do adapted it for VOA Learning English. Caty Weaver was the editor. Write to us in the Comments Section or on our Facebook page.